We managed to squeeze into the tiny front bar of this Fuller's hostelry, which certainly possesses a bit of character. Our main intention was to see what ales were on. 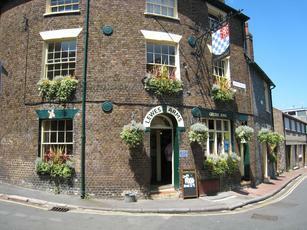 As everywhere else (seemingly) in Lewes, they had Harvey's Sussex Best Bitter on. There was also Fuller's London Pride & HSB & Seafarers from Gale's. Guests were Dark Star Hophead, Everard's Original & Adnams Ghost Ship. I thought that was a decent selection for a Fuller's pub. Nice place. Good beer. Respectfully and well run by Fullers. Great location. Went twice in November 2017. Terrible beer selection unless you enjoy Fullers or Harveys. Very much an all day food pub. Fabulous landlady, moody bar staff and friendly bar staff. Old locals have moved on and drink elsewhere nowadays.